Tropics are Creeping to Life: When Does Ana Form? Ana “AH-nah”, a word sometimes linked to “again”. 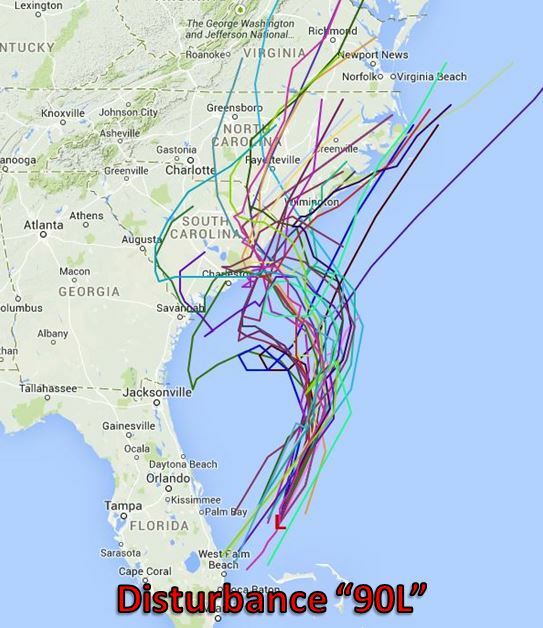 In this case, it will start the Atlantic hurricane season this year sooner or later. That sooner could come sooner than this year’s calendar says it should. Invest 90L was designated early this morning on a non-tropical disturbance located between the northern Bahamas and the Carolinas off the coast of Florida. Besides whipping up the seas in the western Atlantic, producing some small hail, and some light to moderate rain in the Bahamas and the lower two-thirds of Florida, impacts thus far have been low with this system. As expected, this disturbance is reorganizing while transitioning to a fully tropical or subtropical system while also fighting off typical trouble makers such as dry air and shear. Throughout this afternoon, the SPC Mesoanalysis continues to show a frontal feature to the north of this northern more robust low, most likely a warm front. The invest remains weaker, and more enshrouded in drier air to the west and north. 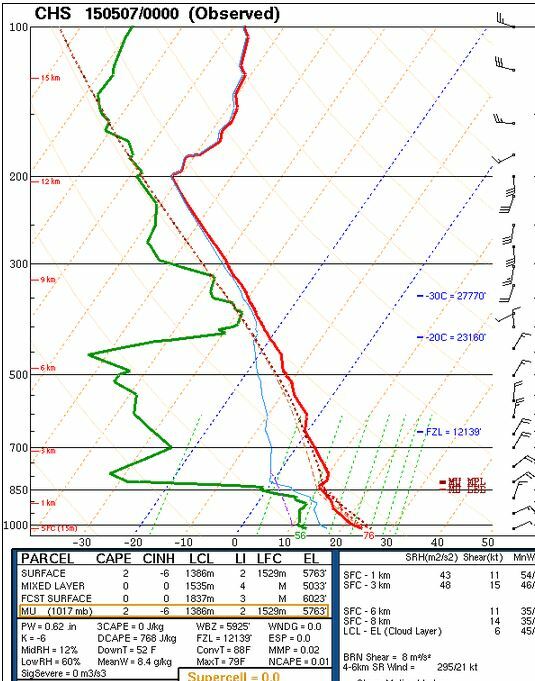 The weather balloon from Charleston shows a very deep layer of very dry air, which will be problematic for 90L. The dry air between 850 and 450 mb exists on the western and northern sides, and it has seen to have done some decent inhibition of convection this afternoon. Humidity in the mid layers has been as low as 12%. The profile is similar in Jacksonville. Vertical wind shear has fallen, and if forecast to continue to weaken over the next 48 hours. It should be noted that wind shear impacts within subtropical systems and tropical systems is different since the energy sources are different. With tropical systems, wind shear escorts energy away from the system’s core through tilt and is generally inhibitive. This processes is different for subtropical systems since they are already somewhat tilted. Dry air will be a bigger inhibitive factor. Rainfall: 1-3″ of rainfall in possible Between Charleston and Virginia Beach, but much higher totals are possible over the Atlantic. Any retrograde or looping paths could significantly increase these totals. Wind: Gusts of 40 mph or higher are possible in the coastal waters of Florida, Georgia, and the Carolinas through Saturday, with winds possibly reaching tropical storm force sustained winds near the landfall point and over the Gulf Stream. Rip Currents: There is a high risk of rip currents on Thursday and Friday mainly on the northern side of the low pressure system. 4-6 foot waves will accompany these currents. Avoid the beach and the waters on these two days. Models have trended a tad bit to the west in recent days, but this will make a big difference. The main reason that conditions are favorable right now for development is that this system continues to sit over the warm Gulf Stream. If 90L slides off of the warm waters, then conditions will be less favorable. 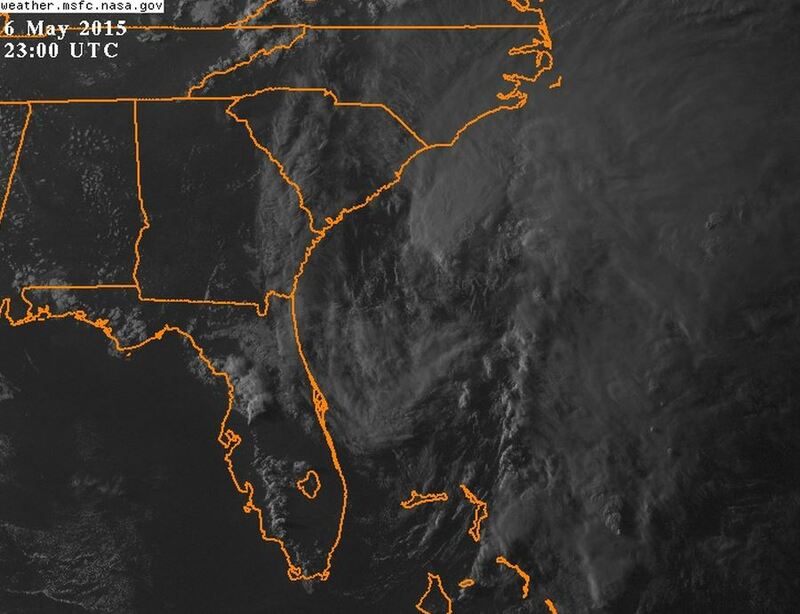 There is an area of much cooler waters along the Carolina coasts that is not favorable of cyclone enhancement. If 90L gets stuck there, weakening is possible. The western trend in the models leads me to believe that this cold shelf is where 90L will reside for upwards of a day or two. This will likely be a subtropical system if it slides into the colder shelf waters. Most models have backed down from developing what will still likely become Ana into a moderate tropical storm. Most currently only forecast a weak disturbance, and I agree with that. Rainfall totals have not changed much, but could change significantly if the track shifts westward or slows down. Bottom Line: This will probably be known more as a rainmaker than a wind producer, especially if this loops or gets stuck just offshore of the Carolinas or Georgia. This system will likely be more of a late week/early weekend pest for most, however even weak systems can be deadly. This is not a beach weekend. I’ll update more tomorrow and on twitter @JonathanBelles. Stay tuned to the tropical weather updates from the NHC (located to the right of this post) and your local NWS forecasts and advisories. Stay safe! To my friends in Oklahoma, Kansas, and Nebraska this evening, it is my utmost hope that you are safe as well.